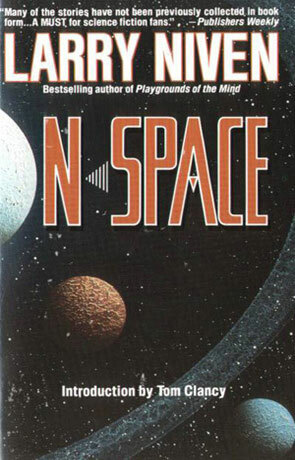 N-Space is a collection of short science fiction stories by Larry Niven. Thirty-something stories in nearly seven hundred pages, including a bibliography about and by Larry Niven - N-Space is one of my favourite collections. The only thing that bugs me about it is the excerpts from longer stories (these are World of Ptavvs, A Gift From Earth, Ringworld, Protector and The Mote In God's Eye), they don't really tell you anything about the full length stories - the only thing they do is make you want to read the full length story and you already knew that you wanted to do this, if you are a Niven fan. N-Space contains a lot of interesting stories, but I will only mention a few of them namely my favourites: The Fourth Profession, is about a bartender who gets "learning pills" from an alien "Monk". Man of steel, Woman of Kleenex, about the mating problems of Superman - not a story, but an interesting and funny essay about what would happen if Kal-El tried to have kids (you can read it right here). Madness Has It's Place, about the start of the Man-Kzin Wars. N-Space, not only contains good stories but also interesting and sometimes funny forewords for most of the stories. I looove that. If you are new to Niven, this is a great way to get to know him and his works.